Word has been received of the death of David L. Windham, 84, of Lawton. Mr. Windham passed away on Sunday, January 27, 2019 in Lawton. David was born on July 14, 1934 in Brundidge, Alabama to Howard and Eula (Bradley) Windham. He joined the United States Army as an air compressor operator. 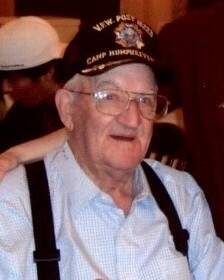 He proudly served in the Korean War. After being discharged from the army, David left Alabama and moved to Oklahoma. He first worked at Montague Farm and later worked for EB Lacey as a delivery driver. After that, David became a carpet layer, working for Bowman's, Conway and Hale, Greg Lewis, and later as a private contractor. He retired from carpet laying with over 40 years of experience. Shortly after moving to Oklahoma, David met and married Nan Garner. They were married for 34 years and had three children. David later married Dorothy Dowling and they were together for 15 years before she passed away in November of 2013. He then met his "Honey", Yvette Trainor and they were together for his last three years. She was very devoted to him and was his caregiver and supporter in his final days. He loved her very much and never wanted her to leave his side. David enjoyed fishing and hunting and going to the Lawton Speedway and watching wrestling. After retiring, he loved traveling with his RV club and attending the senior dances at various American Legions around Lawton and Cooperton. David was fiercely protective of his family and would do anything for them. The family would like to thank Aspire Hospice for all of their loving care during his final days. He is survived by two sons, Ellery David Windham and Kelly Windham, both of Lawton; his daughter and son in law, Kristen and Marlin Fitzpatrick, of Lawton; five grandchildren; 11 great grandchildren; his niece, Deborah Connor and husband, Jimmy of Alabama; his nephew, Jimmy Floyd and wife, Corliss of Alabama; and many cousins and a host of friends. He is preceded in death his parents; his step parents; and his sister, Fannie Mae Floyd. Memorial contributions may be made to the Leukemia Foundation at 500 N Broadway, Suite 250, Oklahoma City, OK 73102, the American Legion at PO Box 301, Fletcher, OK 73541, or Salem Missionary Baptist Church at PO Box 24, Lawton, Oklahoma 73502.